Yeah, but: I have one simple request. And that is to have sharks with frickin' laser beams attached to their heads! The Long Version: I wouldn't have thought that it would be this hard. Having a reader that can handle all of the various memory card formats and also lets me plug in my iPod and printer's USB cables shouldn't be a big request. After all, multi-card readers are cheap and plentiful, and USB hubs are cheap and plentiful. But no matter how much I looked, I couldn't find a combination one for sale in Canada. Enter my semi-annual odds-and-ends order from B&H. They sell the Iogear GUH286, which is a useful product with a decidedly unappealing part number. 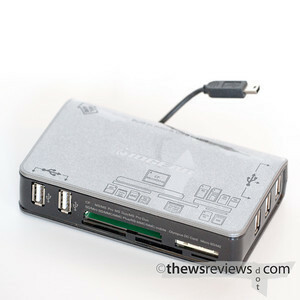 It can read just about anything with electrical contacts, and has five USB ports. Two are on the front, three face the side, and there's also a short cable with a mini-B USB connector on the back that can connect to suitably-equipped devices. It even has an auxiliary AC power adapter to charge any connected devices even when the computer is off. It does absolutely everything I want it to, adds a couple extra ideas on its own, is well built, and costs less than $35USD.